What shall it profit the Labour Party if it shall gain the whole world and lose its own soul? Margaret Thatcher's greatest achievement, according to Margaret Thatcher, was "Tony Blair and New Labour. We forced our opponents to change their minds." a) Jeremy Corbyn being the only left-wing candidate nominated for the Labour leadership election in 2015.
b) Jeremy Corbyn's extreme difficulty getting nominated at all by Labour MPs. "I fully acknowledge and recognise that those colleagues who nominated me – MPs who nominated me – may not necessarily agree with me on the pitch I’m taking or my views on many things...But they also felt there needs to be a full debate on policy in the party"
A former Blair advisor described the 36 MPs who did nominate Corbyn in order to have an inclusive debate as "morons" who needed their "heads felt" and "should be ashamed of themselves". Some of the 36 would probably, with hindsight, agree with him. "At its most crude, Thatcherism represents a belief in free markets and a small state. Rather than planning and regulating business and people's lives, government's job is to get out of the way." Thatcher's conversion of New Labour meant the political tug-of-war was reduced to the Tories pulling to the right at one end, and New Labour pushing to the right at the other. Less a tug-of-war, more a sprint for the cookies and orange squash on the benches of power. 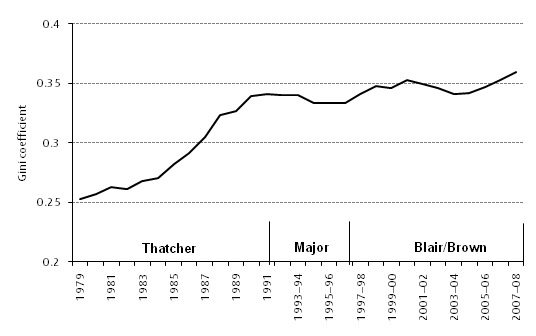 New Labour, during its years in office, edged the government even more out of the way of "business and people's lives". New Labour presided over the chronic decline of the manufacturing industries and enthusiastically pursued the ultimately catastrophic Tory policy of unleashing the finance industry. New Labour swallowed the idea that the economy is best left to the private sector, chanting the Tory mantra that business owners becoming 'filthy rich' would, by their benevolence or by the unintended consequences of their selfishness, enrich everybody. The reality was inequality in the UK that had risen rapidly under Thatcher, continued to drift to even greater inequality under Blair and Brown. The same report shows that the rewards of increasing worker productivity were not reflected in increasing wages for much of the period of the New Labour government. Those who say Corbyn would never attract Tory, LibDem and UKIP voters may well be correct. But they miss the point. 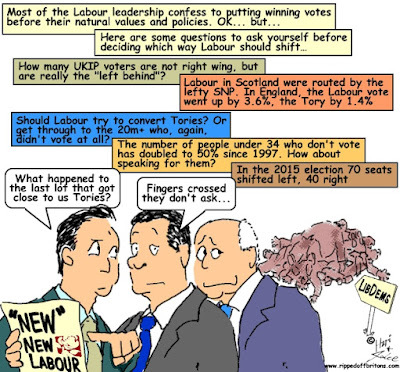 A more left wing Labour Party, led by Corbyn or whoever, does not need to win power by convincing the Tory or any other party's voters to change to Labour. Labour needs to convince those who don't vote at all, who feel left behind, that Labour offers them something worth voting for. In plain English, Beecroft reckoned "a significant part of the national workforce" is slacking and could do with a bit more fear to perk them up. Jeremy Corbyn would have the same effect on British politics. To paraphrase Beecroft, fear of a left wing alternative would produce an instant improvement in the treatment of a significant part of the national workforce. 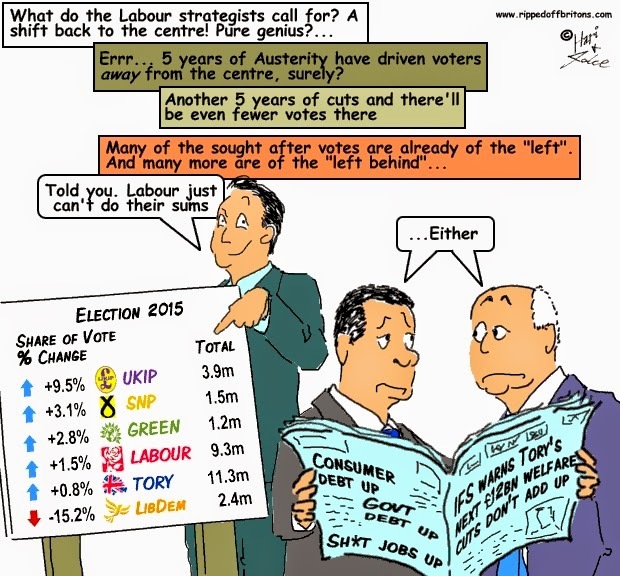 Britain needs effective parties on the Left and on the Right. If Labour decides to move Right in order to win elections, then it may gain power but will lose its soul. His critics say Corbyn lacks the guile required to lead the Labour Party effectively. But will any of the other three more guileful candidates shake off their fixation on doing whatever is needed to achieve power, and achieve power by doing whatever is needed to represent the Left Behind?